Why to submit to J4R (Journal For Research)? J4R (Journal For Research) is an international peer reviewed, open access, online journal. 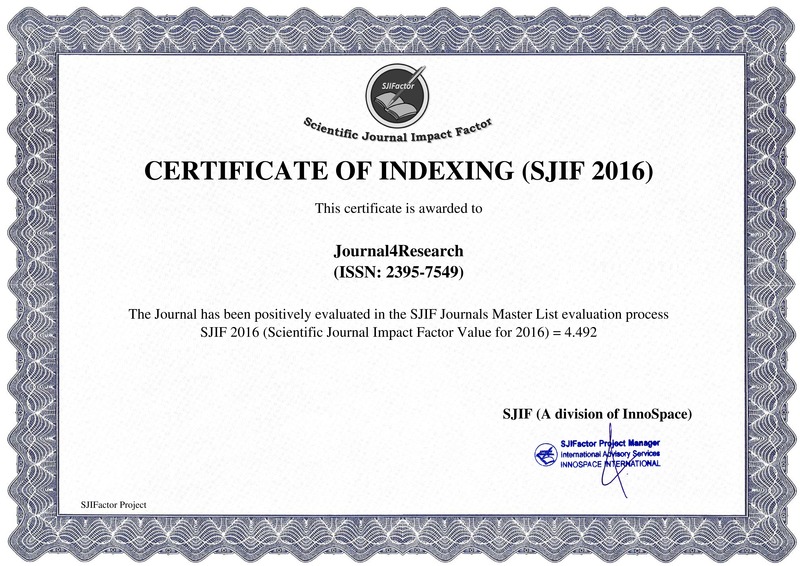 What is the ISSN number of J4R (Journal For Research)? What is the Scope of J4R (Journal For Research)? What types of paper are published in J4R (Journal For Research)? How can I submit my manuscript to J4R (Journal For Research)? How much time does J4R (Journal For Research) take in review process? The editorial board is highly committed to the quick review process of the paper, but not with the sacrifice of the right judgment of a paper. The review process takes maximum two weeks. Can I submit more than one paper for the same issue? Yes, you can submit more than one paper at a time. What is the frequency of publication of J4R (Journal For Research)? J4R (Journal For Research) is monthly journal. It publishes one issue per month. What is the copyright policy of J4R (Journal For Research)? The authors retain the copyright of all their work published in J4R (Journal For Research). All articles published in J4R (Journal For Research) are open access and are licensed under Creative Commons Attribution 3.0 License, which means the articles are universally and freely. My paper has been accepted for publication. When do I pay Article Publication fee? Article Publication fee will have to be paid after the manuscript has been peer reviewed and accepted for publication. The corresponding author will be responsible for arranging the payments. How many authors are allowed per paper? Is there a maximum limit for the number of authors? Yes, at present, maximum of FIVE authors are allowed per paper. How to join the Reviewers Committee? We welcome applications to join the Reviewers Committee. The possible reviewers have to fill the Join Us Application Form by visiting JOIN US page. Please allow us 1-2 weeks for processing your application.